To meet daily expenses, the former NSA contractor is relying on savings and occasional donations and not selling secrets, according to his lawyer Anatoly Kucherena. Edward Snowden’s lawyer says the former NSA contract worker is living in a delicate legal situation in Russia, where he was granted political asylum in August. In an interview with Mikhail Barshchevsky, an executive member of the Association of Lawyers of Russia, Anatoly Kucherena speaks about the how Snowden is getting by in Russia, both financially and legally. Does Snowden have the right to help German investigators? Snowden is wanted in the United States on charges ranging from theft of government property to unauthorized disclosure of classified information for his role in revealing secret surveillance operations conducted by U.S. security agencies. Snowden flew into Moscow in July 2013 and remained stuck in the transit area of Sheremetyevo Airport for a month because he had no knowledge of the Russian laws and had no idea what to do next, Kucherena said. "When Snowden landed his passport was already invalid, but he still had his [U.S.] citizenship. He eventually decided to follow the simplified procedure by applying to the [Federal] Migration Service for temporary asylum of up to 12 months,” his lawyer explained. “He was issued a temporary refugee certificate. With this status, he has all the rights and obligations of a Russian citizen, for the exception of suffrage and employment by government agencies." 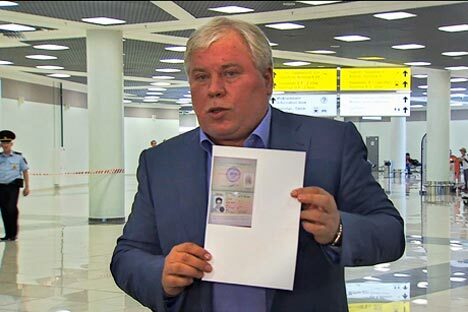 Kucherena says Snowden's U.S. passport was cancelled while he was en route from Hong Kong to Russia, so he found himself unable to fly out of Moscow. He remains a U.S. citizen, however. Kucherena held several meetings with representatives of the U.S. embassy, who insisted on seeing him. Snowden “kept refusing, and I told them that he had not been arrested or charged with anything in Russia, that his freedom was not restricted in any way and that he had the right to decide whether or not he should see them. It is the Americans that have created this problem,” his lawyer said. That did not suit his client, Kucherena said. Opinion. Snowden a 21st century Solzhenitsyn? Kucherena explained that he has long been privy to the recent leaks based on the information which Snowden handed over to journalists back in Hong Kong. Russian President Vladimir Putin is known to have granted asylum to Snowden on the express condition that the latter cease his anti-American activities. "As for the dissemination [of information by media], our president did voice this condition, and we discussed it with Edward. He told me: 'But what am I to do now? I supplied this information on wiretapping, illegal and illegitimate actions of the CIA, NSA, and other [U.S. security services] to journalists back in Hong Kong.’ “ Kucherena recalled. Kucherena said that, as a result, everything that is being revealed now with regard to U.S. security services' alleged wiretapping of state officials in Germany, France and other European countries is based on the materials handed to journalists by Snowden in Hong Kong." Snowden is unlikely to travel to Germany to meet with parliament members, because he may be extradited to the U.S. from there, his lawyer said. However, it might be possible to arrange for such a meeting in Russia. He specifically stressed that Snowden never took any money for the information he revealed to the media. "He never traded in secrets, and he certainly received no money for the information he handed over back in Hong Kong. I can confirm this with certainty, based on his current financial situation,” he said, adding that Snowden is currently living on whatever savings he had when he came to Russia and using it for food, rent, security, and other necessary items. “Some organizations and individuals provide for him, including with money," Kucherena said. Kucherena says Snowden is a top-class IT specialist, and could easily find a well-paid job anywhere in the world. However, if he leaves Russia he will lose his asylum status.